January 24th. We will personally give you a docent tour of "Coastal Cottages Series Eleven". The weather is in the 70's daily, the beach is sandy and the shell collecting is superb. If you enjoy fresh seafood, the most beautiful sunsets and stolling along Beach Trail, this will meet your needs. Perhaps you will enjoy dip in the Gulf of Mexico, where children, pelicans an dolphins swim in harmony. Until we see you on the 24th January may the sun shine softly upon you and yours. I wish I could! These paintings are gorgeous,a nd I love you sailboat in vermillion! Thank you for sharing these beautiful and wonderful paintings!! I so enjoyed reading this post. Love the red sail painting. It is fascinating! I wonder if the red sails have something to do with Ireland. Do they have some special meaning? What fun. Painting on the beach. Wow. I wish I could paint seriously. But I never got the hang of it. Still, it would be worth doing if I could hang out at the beach and kibbitz. P.S. Thanks for sharing the beautiful results of all your labors. thank you so very much for your visit to my blog and your sweet comment...love the pics of you and the ladies, blowing in the wind on the beach painting...magical. Thank you Helen for taking time to visit me and for painting such a beautiful comment that encourages what I do. 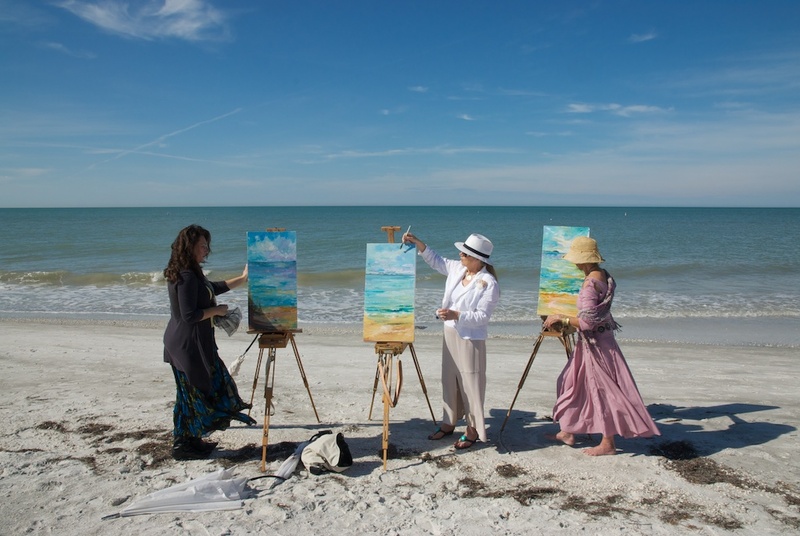 As I have said before, time and time again and again, I so long to paint on that sand filled beach at the hem of the sea painting the beauty you see right along side of you. Keep inspiring all things through your eyes. A beautiful month of hearts, hugs, and kisses.